I have been making my own homemade cleaning supplies for a few years now and absolutely love them and they work so well. Reusable wipes would have to be my favourite. Initially it was to save money, as the cost of cleaning product added up quickly at the checkout. However, over time I could see the benefits DIY cleaning products were having on my family (3 out of 5 have sensitive skin with psoriasis and eczema), as some store-purchased products can irritate the eyes and skin. So over the past few years, I have started to reduce the amount of chemicals I use around the home, replacing most of my commercial products with homemade versions. 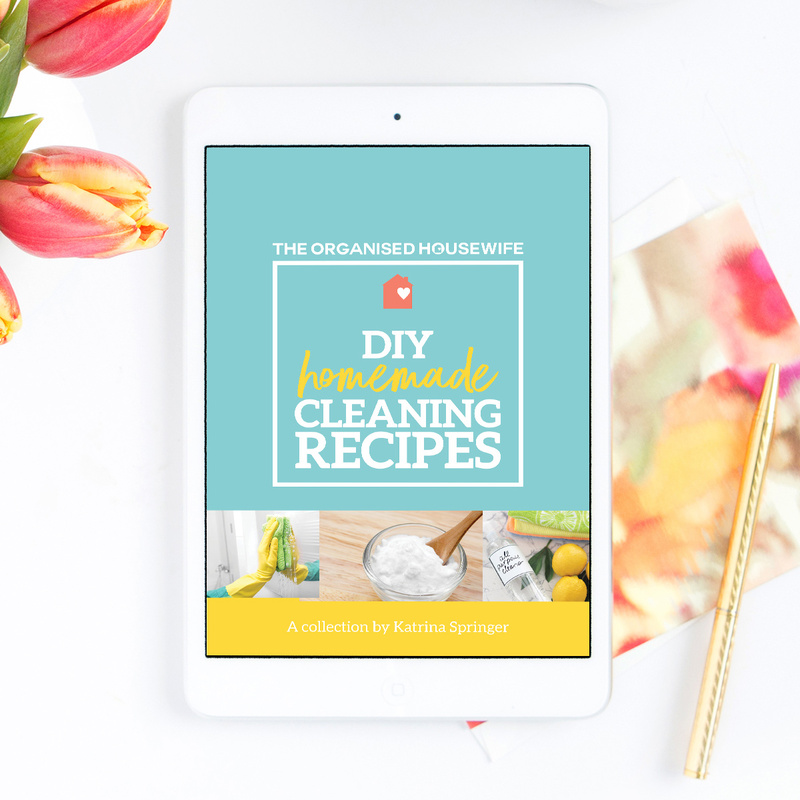 DIY HOMEMADE CLEANING RECIPES EBOOK – This 28 page eBook includes practical Homemade Cleaning Recipes that you can make at home yourself, using products you more than likely already have in your pantry. There are recipes for cleaning the kitchen, bathroom, floors, carpets and more. Save money and reduce chemicals and toxins in your home by making your own cleaning products. Available as an instant download from my shop HERE. 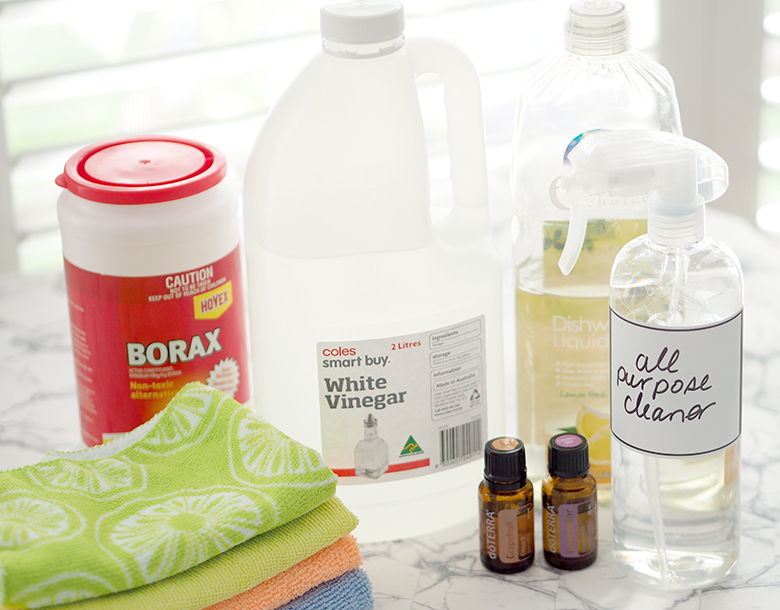 Making your own homemade cleaning products really is easy. Surprisingly you will find you have most ingredients already in your kitchen. Baking soda, also known as bicarb powder, is an ideal deodoriser. In addition, it’s also an effective antiviral agent that can eliminate grease and grime, especially when used together with vinegar. Use the bicarb/baking soda you find in the baking aisle. The natural acidity in vinegar makes it a great natural anti-fungal and antibacterial to disinfect, cut through grease, de-scale, clean glass and so much more. There are so many different ways to clean with vinegar. Use the white vinegar you find in the dressing/sauces isle at the supermarket. I always choose homebrand. Essential oils help to refresh the air to give a more pleasant smell. However, there are many more benefits than just making your home smell nice. Add some essential oils like lavender or tea tree oil into any natural cleaning recipe for an antibacterial effect that smells lovely and fresh (read more here). Join my Facebook group The Organised Housewife – Essential Oils. I use doTERRA Essential Oils. You can purchase oils at 25% discount, there’s no minimum spend and there’s never any obligation to make another purchase if you don’t want to. You do NOT need to place an order every month or on-sell to friends or family. You simply get to save 25%. 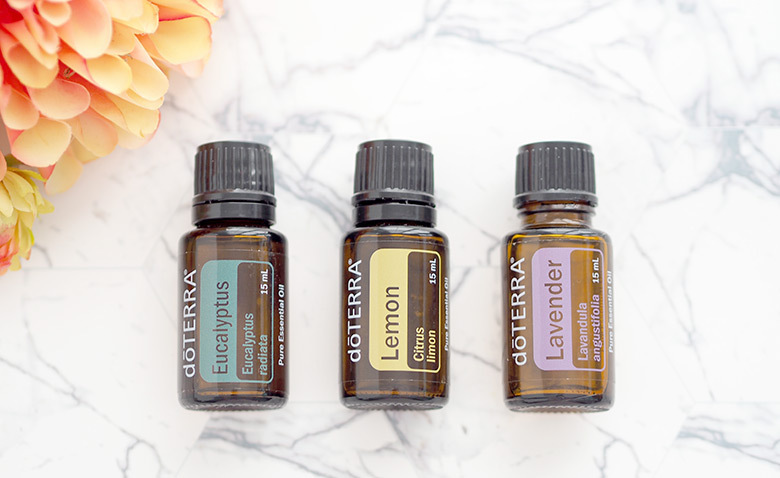 Read more: How to buy DoTERRA Essential Oils and join The Organised Housewife – Essential Oils facebook page. Preferably PH neutral, fragrance free and septic tank safe. This will help lift dirt and grime. You can find at your local supermarket – Earth Choice, Fragrance-Free Morning Fresh (ph neutral) and ecostore. Use your standard table salt as an effective scouring agent. Pour salt mixed with hot water down the kitchen sink regularly to deodorise and keep grease from building up. Mix salt with Lemon essential oil and use to remove stubborn coffee and tea cup stains. Coupled with baking soda and vinegar, this makes a really good abrasive cleaner. Powdered borax is white, consisting of soft colourless crystals that dissolve easily in water. It is an important boron compound, a mineral and a salt of boric acid. Borax can be found at some supermarkets, however I found mine at Bunnings. Many question if borax is natural, I have done so much research and can’t find anything to prove it’s not. My personal opinion is that it is safe to use within my cleaning products. 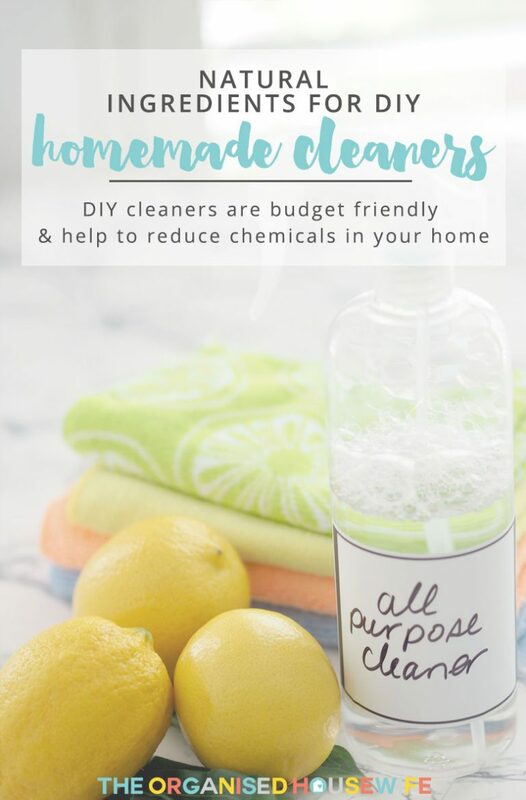 It’s very effective and I just love how my homemade all-purpose cleaner can clean just about everything. I use micro-fibre cloths as they are reusable. Simply throw them into the wash and hang on the line to dry. I use paper towel for the really grotty cleans such as wiping grease, pet puddles and around the toilet. To make your homemade cleaners, you are going to need spray bottles. I am trialling a few different ones at the moment and will share details after I have spent some quality time using them (one has failed my test). However, you can find bottles at the grocery store and Kmart. There is a debate that glass is better, especially when you are using essential oils. However, I prefer to use plastic as I knock my bottles over all the time and would worry glass would break. Do you have any tips for a natural and healthy cleaning? Do you make, or have recipe.for homemade laundry powder.? Grate your soap of choice with a hand grater. Mix with borax and washing soda. To get it to combine better, rather than settling in layers, whiz for a few seconds in a food processor. Wash utensils well after making. This is suitable for a front loader or a top loader machine. Use two tablespoons per load. Blitz slowly up to speed 9 until very fine. Approximately 20 secs. Scrape down. Note: You want this to be a super fine dust so that it dissolves easily in cold water. If you are a warm/hot washer it won’t matter if its slightly coarser. Place everything into the bowl. Blitz on speed 6 for 30 seconds. You just want to break down the ingredients slightly and ensure they are well combined especially the essential oil. Amazing!! Thank you so much for sharing Susie 🙂 I will have to give this a try. Hi Katrina, where did you get the clear plastic spray bottles? Hi Katrina, do you use the all purpose cleaner to clean your toilets or do you have a different recipe that you use? Thank you! My kids also suffer from eczema so I am always on the search for using natural products instead of chemicals. Thank you. I was looking for some ideas for this. Thanks for sharing. Much appreciated.